The Football Adventurer: A Hullbridge too far! It is a cold, foggy, Tuesday night in March, 2011. I’ve not made the trip to see Southend at Gresty Road, Crewe this evening. A combination of low funds and used holiday dates has left me with little option than to choose a match closer to home to satisfy my raging appetite for football. Now despite my allegiance to Southend United, those who know me best see me as some kind of ‘football hippie’, as I keep an eye out and from time to time watch several other teams who have in some way touched my life. A quick check of tonight’s local fixtures will give me some ideas. No game for Great Wakering Rovers; Southend Manor and Canvey Island both at home; but hold on, what’s this? They don’t come much bigger than this one! Due to my dad’s East End upbringing, one of my ‘other teams’ is his original local club and current Essex Senior League strugglers Clapton. Now I’ve watched Clapton a number of times over the years – I can even recall the last time the club enjoyed a purple patch back in the mid 1980s when they beat strong Southend United teams two years running in Essex Cup competitions. In fact, the latter of those games, a 1-0 Clapton victory over the Shrimpers at Dagenham’s Victoria Road ground on 9th May 1984 represents a milestone in my somewhat casual relationship with the club, in that it was the last time I saw them win! OK so I don’t see them every week, no more than three or four times a season in fact, but twenty-six years without winning! Come on! In fact, during this incredibly barren period I have not seen them so much as pick up a single point! Adventures to the likes of Great Wakering Rovers, Southend Manor, Chelmsford City, Basildon United, Bowers & Pitsea and even the odd pilgrimage to their Spotted Dog home, it matters not, they have all resulted in defeat, sometimes a thumping one! Nevertheless, tonight I’m confident the pain will end – and the place for this personal history making event will be Lower Road, the home of Hullbridge Sports Football Club. 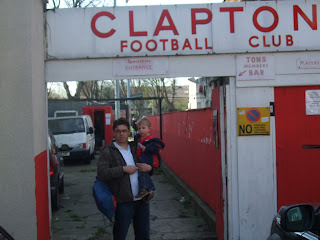 My newfound optimism is because Clapton have found some form of late. Well, I say ‘form’ – they are still hopelessly bottom of the Essex Senior League, but just recently a couple of draws and a surprise win at Barkingside have given tonight’s travelling support (consisting of me and partner in crime Ed), a bit of belief. Standing in Clapton’s way are a Hullbridge team who have had a steady season. For those who are unfamiliar with the town, Hullbridge is situated south of the river Blackwater between Hockley and Rayleigh. I’ve crossed paths with the club on several occasions with some pretty dire outcomes! A defeat in a local cup final was bad enough but it gets worse. I once double booked seeing a girl with Southend United playing a pre-season friendly at Lower Road. I left the ground at half time complete with Old Spice aftershave and my best t-shirt in a bid to impress the temptress in question. Southend had been uninspiring during the opening half, leading by a single goal, I was sure I’d not be missing much as I set off in search of love. Result: Southend go on to score another ten goals (winning 11-1) and the young lady I had ditched football for was completely uninterested in me and the date soon fizzled out leaving me in limbo as it was too late to get back to the match! Moral of the story: never put a woman before football! However bad things tend to happen in threes and so it proved. On 2ndth December 1999, dad and I ventured to Lower Road for possibly the biggest game in Hullbridge’s history. The club’s under 18s team had reached the third round of the FA Youth Cup and would now face Premiership giants Blackburn Rovers. Along with a record crowd of more than 800, the old man and I witnessed a brave Hullbridge team beaten by six goals to nil but far from disgraced. Having used ‘waiting for the crowd to disperse’ as an excuse for a cheeky pint, I arrived home late that night only for the original Mrs J to give me the silent treatment. The following day Mrs J ‘the first’ decided that my trip to the banks of the Blackwater had been a bridge too far. She packed a bag and left for greener pastures (which turned out to be Billericay). Moral of the story: seriously, never, ever put football before a woman! We arrive at the ground with minutes to spare but already there is a problem – only seven Clapton players have arrived. In some kind of bizarre mix-up the others have found themselves at Southend Manor’s Southchurch Park ground, thus causing mass confusion as Manor are hosting Basildon United tonight! The delay gives us the chance to grab a quick pint and take in the early stages of the Champions league match at Manchester United, which is showing on the clubhouse telly. A glance out of the window tells us the missing men have arrived, although with the fog now closing in around Lower Road I wonder if we will see the match to its conclusion! Ed grabs a cuppa and some chips from tea bar. “Four minutes for the chips, mate” the man behind the counter informs him. The radio behind the bar is playing “Different Corner” by George Michael, and the man behind the counter sings his own word to the muffled music. Ed turns to me and states, “That’s the first time I’ve heard that sung with the word ‘cheese’ in it!” The chips are passed across the counter looking like they have been cooked four minutes too long, but once swimming in ketchup they give Ed the gourmet taste he requires. The game gets under way with Clapton making the early running – only a couple of smart saves from the home side’s goalie prevents the visitors taking the lead. Having spent a childhood watching the likes of Southend, Orient and Colchester I’m extremely cautious of over optimism, but tonight Clapton are performing better than I’ve seen them in ages...years even. A goal, Hullbridge take the lead, and it’s not just any goal, it’s a bloody good one, thundered in, Roy of the Rovers style, by Bridge’s Mike Shelley. Hullbridge begin to take control of the game but then, like a bolt out of the blue, Clapton draw level. Djibai Djaio has found the net from close range sending the visiting support into mild delirium as well as agitating the Hullbridge fullback, who receives a yellow card for his troubles. Despite several narrow escapes, we reach half time with the scores level. Clapton are clearly buoyed by the goal as they start the second half strongly, however once again our hopes are dashed as that man Shelley restores the home side’s lead. The game becomes somewhat scrappy as Hullbridge look to put the result beyond doubt but with twenty minutes to go Clapton once again pull level thanks to a spectacular effort from Ali Shikheey. This is it, I’m within touching distance of seeing a history making result; surely Clapton won’t throw it away this time? And surely, with about ten minutes left on the clock… Clapton throw it away. A mix-up in the visitors’ penalty area gives a chance to Chris Brown, who crashes home the night’s final goal. As the game ends, the already irate Hullbridge fullback receives his marching orders for a mis-timed tackle and Clapton almost grab a last gasp equalizer as the ball flashes agonisingly wide of the goalie’s left hand post. The referee’s whistle sounds with yours truly amid mixed emotions. Clapton had come mighty close to claiming a point – some could argue all three! On the other hand, twenty-six years is a long time, perhaps some kind of world record. If only Roy Castle were still with us, he could verify such a statistic. I might have even managed a cameo appearance on the Record Breakers! Had Clapton won where would that leave me? After all, God only knows if I have enough years left to achieve such a feat again! Therefore, I’m left with a dilemma. As I write this tale, we are planning a visit to the Old Spotted Dog to see Bowers & Pitsea FC, a team who like Clapton are from the lower reaches of the league, and one the Tons will fancy their chances of beating. Do I take the risk on ending the record run or should I play it safe and wait until they face a team from the top end of the league as I selfishly go in search of universal acknowledgement as the unluckiest football supporter in the world? The last time I saw Clapton win: the facts. Barry Brooks, Ted Majoram, Jon Bolle, Gary Seward. Trevor Whymark, Greig Shepherd, Alan Rogers.